“The Prodigy” is neither the first nor the last horror film about a bad seed, and while not wholly unexpected in every beat, it does dare to go to some pretty ballsy, disturbing places along the way. Recognizable to fiercely devoted genre fans, director Nicholas McCarthy (2014’s “At the Devil’s Door”) steps into the mainstream with his first wide theatrical release, working from a script by writer Jeff Buhler (2008’s “The Midnight Meat Train”), and the result is pretty good. Melding together 1988’s “Child’s Play” and 2004’s “Birth” with every movie about an evil child, the film does offer an intriguing variation on the immortal sub-genre, although that wrinkle is revealed before the title card that watching the film becomes a waiting game for the characters to catch up with what the viewer already knows. 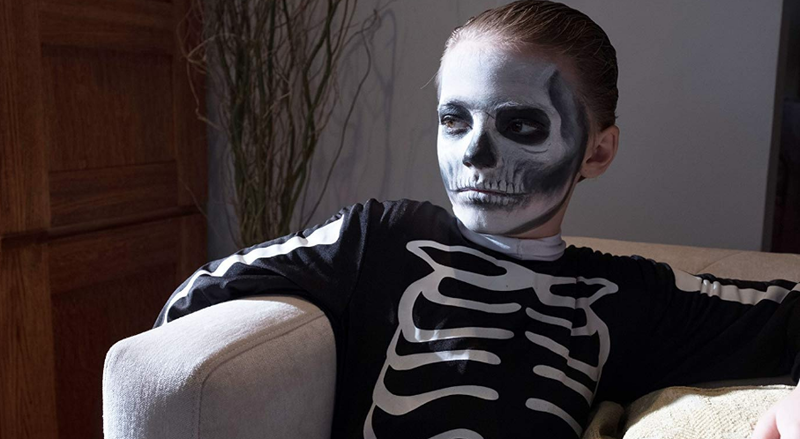 It is decidedly exploitative, but for an unsettling, R-rated horror offering released so early in the year, “The Prodigy” is more than serviceable. At the same instant, married couple Sarah (Taylor Schilling) and John (Peter Mooney) bring their son Miles into the world in Fox Chapel, Pennsylvania as severed hand-collecting serial killer Edward Scarka (Paul Fauteux) is ambushed and killed by a SWAT team in Montgomery Country, Ohio. Other than being born with heterochromia—one eye is brown and the other is blue—Miles is a completely healthy baby, so developmentally ahead of the curve that he begins talking at just 20 weeks. At 8 years old, Miles (Jackson Robert Scott) has an IQ that’s off the charts, but he struggles to socialize with other kids his age, to the point of there being a violent incident at school and an injury with the babysitter at home. Then, checking on him at night, Sarah hears Miles muttering gibberish and records it, only to discover that it’s actually something profane in a rare Hungarian dialect. 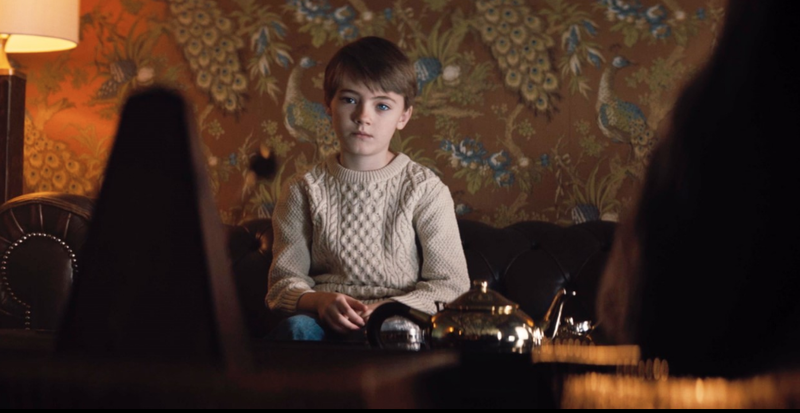 On the advice of Miles’ child psychologist, Sarah gets referred to Arthur Jacobson (Colm Feore), a researcher with a theory of his own, but Miles’ behavior gets even more disturbing from there. “What is wrong with Miles?” is the question being built around the film’s marketing campaign, and it ends up being answered from the very beginning. Opening with a would-be victim (Brittany Allen) escaping with one hand still intact from her captor and intercutting to Sarah going into early labor, “The Prodigy” tips its hand early with the death-and-birth connection of two souls, Edward Scarka and Miles, through reincarnation. 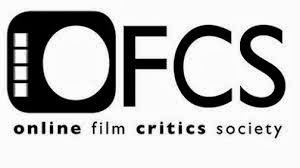 That forthright decision sheds some of the mystique, but actually works more to the film's advantage rather than saving it for a third-act exposition dump. Director Nicholas McCarthy stages some familiar shocks, like Miles taking a pipe wrench to a classmate and having something to do with his family’s “lost” dog, but Miles’ hypnosis session with Arthur Jacobson is more riveting, toeing the line between uncomfortable and darkly amusing, and there is a boldly suggestive moment where Miles holds hands with his mother during a regular staring contest. There is also one humdinger of a jolt involving Miles running into Sarah’s arms that, with moodier lighting, is either a homage or a direct steal from 1977’s Mario Bava-directed “Shock,” and an expertly timed scare has Sarah spotting a grown man’s sinister face grafted on Miles’ face. 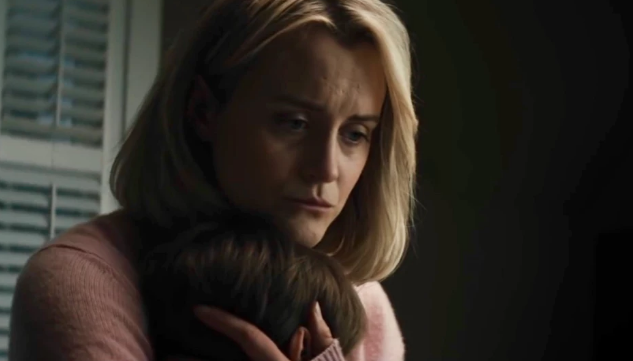 Taylor Schilling (Netflix’s “Orange Is the New Black”) is strong in handling the role of Sarah, who reasonably at first doesn’t buy into the ridiculous notion of her son being the manifestation of a former life to carry out his unfinished business. 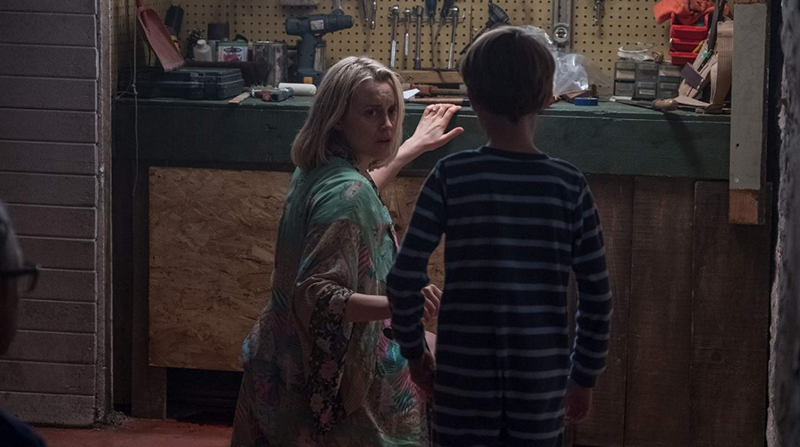 Schilling understands Sarah’s internal conflict and sells the character’s choices to do something reprehensible, making the implausible easier to swallow in terms of what a mother would to do rid the evil from her son. Sure, outside of having a son, Sarah and Peter Mooney’s John are curiously underwritten, never seen at their jobs or even working from home, and never visiting with friends, but perhaps it’s just the tight, albeit superficial, nature of the script. 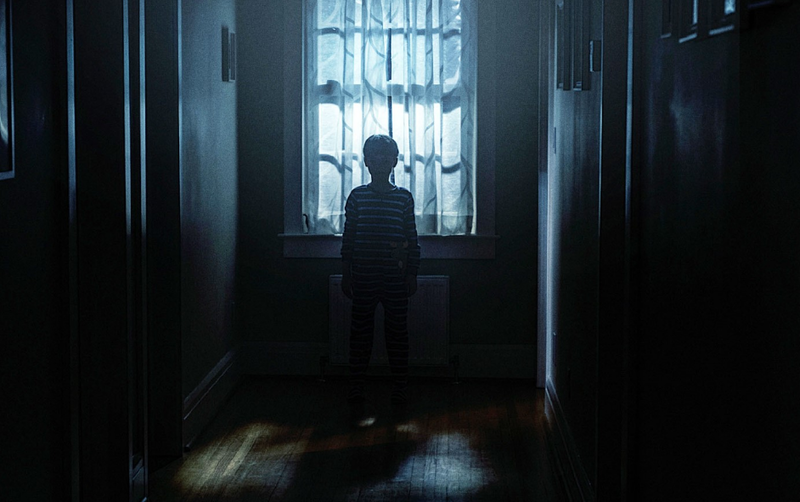 As 8-year-old Miles, Jackson Robert Scott (who played the ill-fated Georgie in 2017’s “It”) effectively flips from sweet and innocent to malevolent and manipulative; like Macaulay Culkin in 1993’s “The Good Son” and so many other actors before him, it’s startling to see and hear a child performer doing and saying such heinous things. 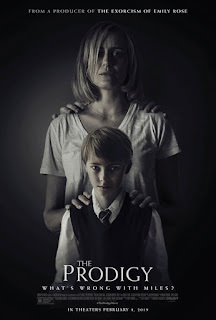 “The Prodigy” is worthwhile enough for what it does right within its genre parameters, not to mention sleekly shot and chillingly scored by Joseph Bishara in a way that’s reminiscent of horror films from the 1970s, but one can’t help but walk away thinking that it could have been more. The fiendish final moments are a little frustrating, too, but they aren’t a cop-out at least. 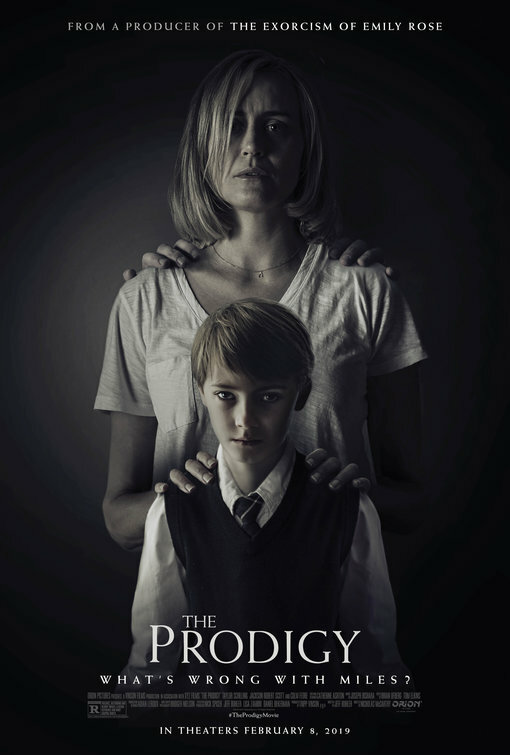 Without setting itself apart from superior like-minded entries, namely 2007’s subtly chilling “Joshua,” 2009’s deliciously diabolical “Orphan,” and 2011’s supremely unnerving “We Need to Talk About Kevin,” “The Prodigy” still fits the bill as another reliable form of birth control.